As graduation day looms ever closer, many students are turning their focus toward securing that first job that will launch them into the career of their dreams. Another increasingly viable option is creating a startup, building the career of their dreams themselves. Michael Gursha ’10 knows that path intimately. He has experience working at big companies like Google and Time Inc., and was the vice president of strategic initiatives at Curemark, an early stage biotechnology company. In 2015, Gursha served as the Newhouse School’s inaugural entrepreneur-in-residence to help Newhouse students explore the possibilities of building their own businesses. In this position, he assisted with the launch of multiple ventures, including FreshU, Power Spike, and Laylo. Alongside his brother, Doug, Gursha has recently launched Rookie Road, a company that creates educational content about sports. Gursha sat down with the Newhouse School to talk about what it takes to make a startup work. How did you become the Newhouse School’s inaugural entrepreneur-in-residence? I had been working with Sean Branagan, director of the Center for Digital Media Entrepreneurship, on various different initiatives around entrepreneurship. So when Newhouse wanted to create an entrepreneur-in-residence position, Sean, along with Newhouse dean Lorraine Branham said, “Why don’t you come up here and do this full-time with us for a year?” For me, it was a no-brainer to come back to a place I love so much. So I said yes and the rest is history. I really have to thank both Sean and Lorraine for giving me the opportunity. It was such a wonderful experience. What are the qualities that a good entrepreneur should have? Here is a quick list of a few qualities I think are extremely important. 1. Persistence. Once you have an idea that you’re working on you have to be persistent about continually pushing it forward. 2. Passion. If you are building something from scratch, it is going to take a long time. If you don’t have passion for the project, don’t do it. Find something you love. You want to wake up excited every day. 3. Vision, making sure that you see the end goal and really understand where you are going. 4. Flexibility. making sure you have a flexible mindset [about] how to accomplish your vision. Ultimately, you have to be willing to shift things and say, “This isn’t working,” and have that flexible mentality to say, “We’re going to try this a different way. 5. Patience. Building a business is a long road and it requires patience. 6. Curiosity. “Always be curious” is something I live by. Ask a lot of questions. Admit that you don’t know everything. Be willing to learn and have an open mind. 7. Lastly, confidence and drive. Believe in yourself and your abilities. What can help new startups stand out in the crowd? Finding something that is unique and then doing it in a quality way. These days there’s a tremendous amount of noise out there relating to media. In order to stand out, at least in the media and content space, you need to think about the unique aspects and quality of your content. You also need to think about your audience in a very deliberate way. Make sure you build a brand that people love and can relate to. How was your experience working with Newhouse students looking to build their own startups? It was awesome! The most rewarding thing for me was to see students evolve over time, from “I have this really cool concept/idea that I’m working on” to actually executing it and creating a physical product. I think one of the most valuable things that I could provide was my perspective based on experience, which students usually don’t have a ton of yet. I would give them advice and say, “Maybe you should be thinking about this,” and sometimes they’d listen and other times they wouldn’t, but all the time they would be learning. I worked with so many talented students during my time at Newhouse; their passion and energy was so inspiring. Can you tell me about Rookie Road? 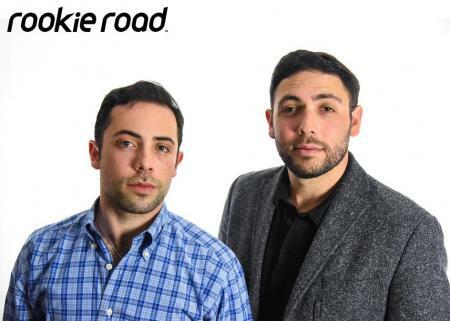 Rookie Road was actually a company that my brother founded. He went to the University of Michigan as an engineering/computer science student and didn’t understand football, which was a big part of the culture at Michigan. It is like if you don’t know anything about basketball, football or lacrosse at Syracuse. Eventually, he decided to teach himself. He tried learning sports by watching TV, reading books, asking his friends for help and browsing the internet. Out of all the available options, there was no easy way to become a new sports fan. Doug began creating his own content to break down the thousands of complex rules, concepts and lingo in sports. This was how Rookie Road was born. I started advising him early on, which eventually led to him asking me to come on board as CEO. Now we are building the company together. We’re off to the races now. We just launched our basic football content and will be launching basketball, baseball, hockey and soccer in the next few months. Our goal is to create quality and reliable educational content that people love. We have a lot of cool things coming in 2018. What advice would you have for students interested in starting their own businesses? The best thing you can do is talk to as many entrepreneurs as possible and have real conversations with them. Listen to their stories. Ask them about the hard parts. If you’re going to build something you should have an understanding of both the positive and the negative. Starting a business isn’t easy. Make sure it is what you want. You will learn an enormous amount from talking to different people and hearing about their journeys. If you decide to move forward with your own business, make sure you surround yourself with great people. Find mentors and advisers who can help guide you. Business is all about people, so find good folks and keep them around.